Gen Xtinct: KISS! That's right, KISS! I remember when Rob and I were first married and we were broke, broke, broke, I still managed to come up with an unbelievable $150 to buy him KISSTORY, this giant book all about the band KISS, and signed by the original four -- Gene, Paul, Ace and Peter. 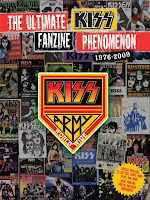 Now there's another book, but it's a lot cheaper: KISS Army Worldwide: The Ultimate Fanzine Phenomenon Book. Apparently it collects a lot of concert pics and fanzine covers. The book cover itself is just a giant collage of zine covers. Remember when people made zines? Today I guess they just make blogs. I was a zine girl for a long, long time myself, and I kind of miss them still. I also have always loved that KISS doesn't have fans, they have an army.